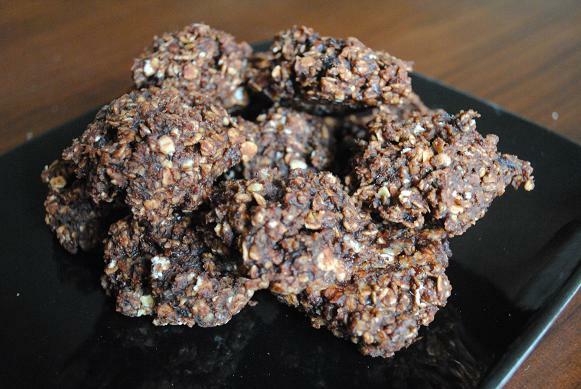 Soft, chewy oat cookies packed with creamy almond butter and chocolate chips. These almond butter cookies won’t last long in your cookie jar! Cookies are one of my biggest downfall. Once the packet is open, it is near impossible to not eat them all – so I don’t buy them. I do bake them at home, but that can be even more dangerous. The small of freshly baked, buttery, cookies wafting from your oven is far too tempting. Knowing there is fresh cookies in the kitchen usually means I will eat them all too. So, it was about time I experimented with a healthier cookie recipe. Using oats rather than flour instantly makes these cookies better and they get their buttery taste and texture just from the almond butter, which makes them healthier than the usual cookies. With the Christmas season approaching very quickly, I think these are going to be making an appearance in our kitchen quite often. You can still enjoy cookies over Christmas, just make some healthy changes. Soft, chewy oat cookies packed with creamy almond butter and chocolate chips. These almond butter cookies won't last long in your cookie jar! Put the banana, date syrup, almond butter (and flavour of your choice, if using), milk and cocoa in a pan and heat gentle for 5 minutes – constantly stirring. Add the oats and stir for 5 minutes. Put spoonfuls onto a baking sheet and allow to cool and set. They are not meant to go completely hard. As they are not baked, they will not go hard like an actually cookie, but they will be hard enough to hold together and have a chewy consistency. These sound really good. I am just starting to put together some holiday recipes, so this will go on the list!